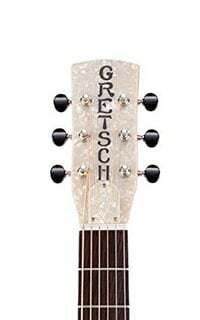 As we mention above, Gretsch specializes in retro, and the design of the G9201 Honey Dipper doesn’t change this – it just oozes vintage, from the weathered finish of the bell brass body to the glitzy 1930s pearloid headstock complete with the vintage Gretsch logo. The body itself is quite small, and features a traditional non-cutaway design with two F-holes in the upper bout. While the body is metal, which gives it a considerably hefty overall weight, the neck is made from solid mahogany and features a rounded V shape, on which the padauk fretboard sits, sporting 19 jumbo frets in total (12 in the clear) and a nut width of 1.75”. It’s super slick to play, with its honey-stained semi-gloss finish. The overall craftsmanship and finish felt very good for the affordable mid-range price – quite ready to go out of the box, even if the action was a little on the high side. What’s lying underneath that shiny coverplate? The G9201 Honey Dipper features Gretsch’s Ampli-Sonic biscuit cone and bridge, handspun in Eastern Europe. 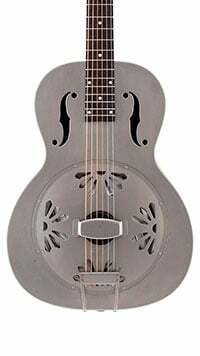 But, unlike some others in the Roots Collection, this Gretsch resonator relies completely on the cone for its projection – no electronics feature. Elsewhere, the hardware stands up to scrutiny, with a hard maple bridge/saddle under the cone, as well as a set of open-geared Grover Sta-Tite die-cast tuners with black buttons, a quality bone nut, and a light set of D’Addario strings. While it looks and feels great, the highlight of the Honey Dipper is the sound. It really does deliver that haunting metallic tone that’s perfect for Delta blues, among many other styles. Perhaps Gretsch put it the best when they say it gives ‘a sound like raindrops beating on a rusty pump house roof’. We’ll happily agree with that! The sustain lingers nicely, while it offers a strong projection, with no real need for electronics – it cuts through any acoustic mix. Gretsch, consider us impressed. It’s not perfect, but it’s actually quite close for the all-round affordable mid-range price you pay. If you’re looking for a trusty companion to accompany your vintage blues playing, you won’t go far wrong with the Honey Dipper. 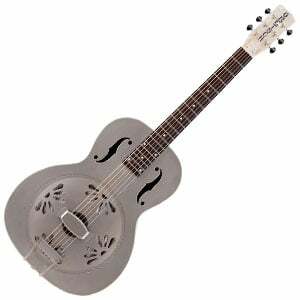 For more info about the Gretsch G9201 Honey Dipper, click here.